Those cactus actually grow as far north as central Illinois. Although the dispersment is very scattered. 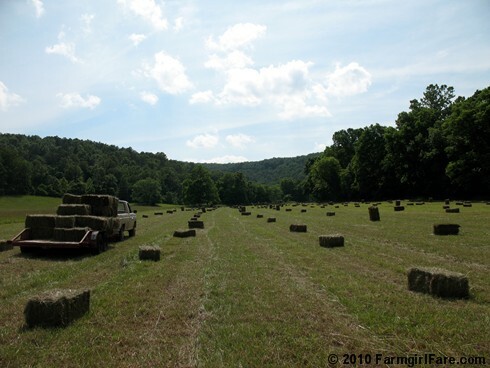 You know when I was a kid I use to stack bales for 10 - 25 cents a piece (depending on the cutting of course, it gets hotter as the season goes on). Keep in mind this was only about fifteen years ago. Man was I dumb. You might have a number of people willing to come out and help you bale/stack the hay. I for one would do it. Think it would be a great experience. Finding help might not be too hard. Summer jobs are hard to come by in this economy... I'm sure that there are some reliable kids in your town who would love an occasional job. I agree with Nathan about paying by the amount of work done instead of by the hour. I was paid by the crate to pick grapes as a kid, and a fair per-unit price kept me motivated. I made a lot more than minimum wage because I was fast and avoided getting in grape fights with the other teens. We are very jealous of your haying from out here in Western Oregon where it hasn't stopped raining since...October. We are generally in-the-hay by now, but there isn't an 80 degree day in sight, let alone the 5 or 6 days in a row we need. We generally only get 1 or 2cuttings here (they get a 3rd in Eastern Oregon where it is much drier. Looks like it will be July before we are sweating, itching, and aching it out like you. Cactus? I had to click over to your old post to see if was a joke. I had no idea cactus grew that far north. I've always thought of it as a desert type of plant. I continue to learn new things from you. Thanks. maybe some strong teenage neighbor boy who wants to earn a little extra summer money? We just finished our second session of haying too. We've got 16 tons in the barn already... and that's only half of what we have to do to finish first cutting. I think I'm going to die. You know, FG, I'm so tired of teaching right now that being a farm apprentice and spending my days working in 100-degree heat sounds good. Perhaps I need a good strong reminder of those horrifically hot months I spent in college working for my dad's golf-course irrigation company. Yeah, I know. I need an intervention.